This thread will show current work projects as they come across my work bench. It's still too cold to really get working too hard but right now some small projects may be completed. Re: What's going happening on the Work Bench???? 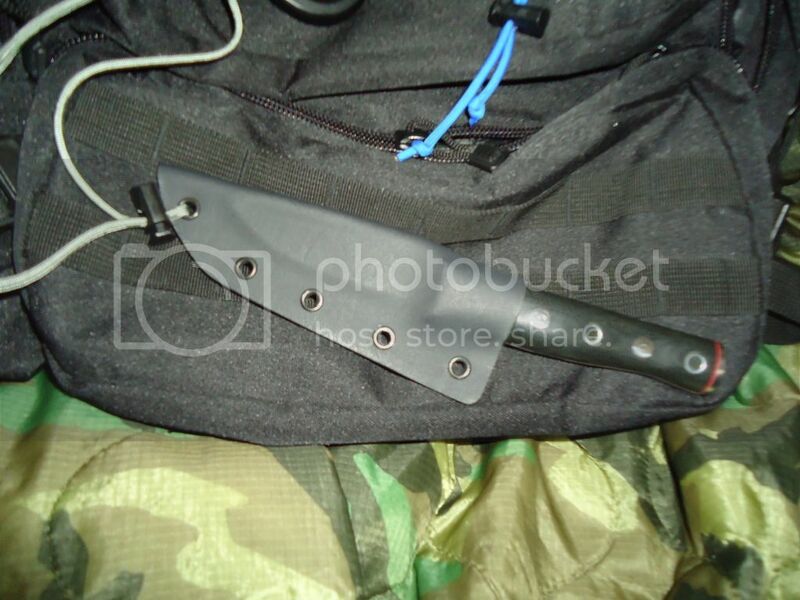 This was a Kydex sheath that I put together for UptheCreek. Sorry no work a long photos. Again, no work along photos. This is my carving kit (still building it up). 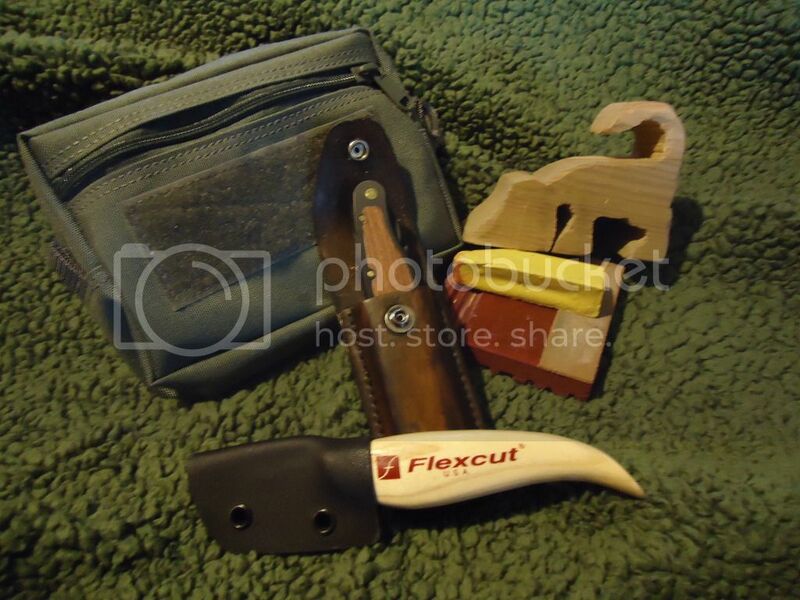 I felt that I needed a kydex sheath for my flexcut so it wouldn't cut my tool pouch. So I made one for it. One day I will finish the dog carving.....I hope. The last couple of days have been in the low 30's. That is why I have knocked out a few small projects. My next project is to find an inexpensive camera to replace the one I dunked in the water at the P & K Challenge. I'm tired off taking crappy photos with my standby camera. Can't wait for you to start building somethings Matt. I really like the WIP post. You need a heater in your shop like Red needs AC. I have my old house furnace in my ex wife's garage. The problem is that I don't have any way to get it to my garage. Once I do get it here, I have the gas lines and exhaust chimney all ready in my garage. I really want to find a new camera though. I found what I had on ebay but I am iffy on buying a used one on there. I really am tired of taking blurry photos with my stand by camera. Got my knife and kydex sheath today. Love it! Have it around me now, Will post my opinions tomorrow after I come off the river! Thanks a million Matt. I hope you enjoy it and it serves you well. That Flexcut sheath will come in handy for sure. Hopefully it will be warming up soon for you. How much do you mean by inexpensive on a digital, Matt? I have been using a Pentax Optio W10. An outdoor camera that is waterproof. It is a great camera (was not inexpensive though) but has one fatal weakness. Video files are in .MOV or Apple format. Big pain just trying to get a player and editing software for it that will work. So I just recently got another point and shoot in a new Nikon CoolPix with video files in Microsoft format but the camera is not waterproof. I got it in a bundle for about $80 so it also has a case and an 8Gb SD card all for about $91 shipped. So I thought it was a good deal getting the bundle. I will just have to keep in mind that it is not waterproof and protect it as best I can. Maybe keep it in a zip-lock bag in the case. All the new less expensive outdoor waterproof cameras I looked at did not come anywhere close to my old Pentax in offered features. Either the batteries were not rechargeable or were not replaceable. Best of luck. I, previously, had a Sony Cybershot DSC-H200. It was about $250 maybe a little more when I got it. It took great pictures until it sunk in the water with me. I was given another type of Cybershot a DSC-W330. This is the one that I have been complaining about. It is now working better. I had it on the "Easy Photo" setting and now that I took it off it seams to be better but still not the same as my old Cybershot. Glad you got it ironed out. I did dunk my Pentax when my buddy's canoe flipped over while fishing on Kissimmee River. The fact that it was waterproof paid for itself that day. The Pentax was about $130 way back when I bought it. I will just keep the Nikon in one or two zip lock bags inside the camera case when I'm not using it. The Nikon has all the features I was looking for but its just not waterproof. I should have borrowed one of my siblings waterproof cameras but i didn't. I had a waterproof pouch for it but I was taking several photos and ended up sticking it in my pocket for a minute and paid the price. I used to get terribly frustrated by the apple format. But windows 7 and above recognizes it now so I no longer have to worry about what format the cameras record. That opens up the selection quite a bit. I pretty much abandoned my old criteria which was the camera had to record in a format windows recognized (which is no longer an issue) and it had to take AA batteries. But they are all moving to proprietary rechargeable batteries now. If you want a decent camera with a good feature set is is getting hard to find one that takes AAs. My new Nikon CoolPix is the S3300 model. The Nikon CoolPix S30 model has a lower optical and megapixel but is waterproof and shockproof. It also uses AA batteries. If you are interested. I did not want AA batteries so that kept me from this model. The weather is getting nicer and some things should be getting finished in the shop/garage soon and posted! I know it has been a long wait.